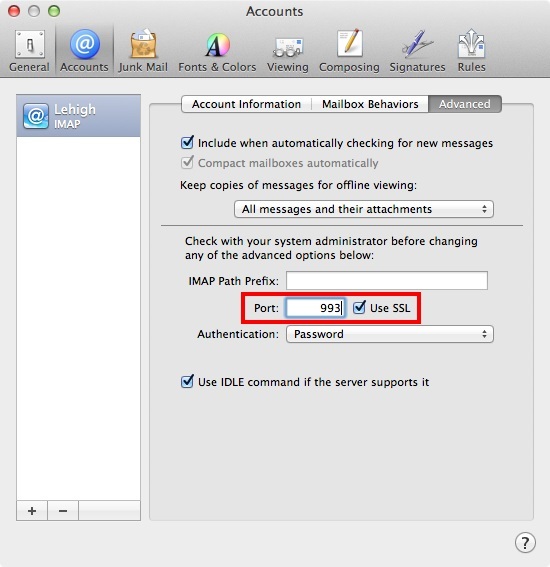 The incoming and outgoing mail server port number settings in Mac Mail are advanced options that tell the Mail application how to communicate with the mail servers. The correct values are 993 for the incoming (IMAP) server and 587 for the outgoing (SMTP) server. 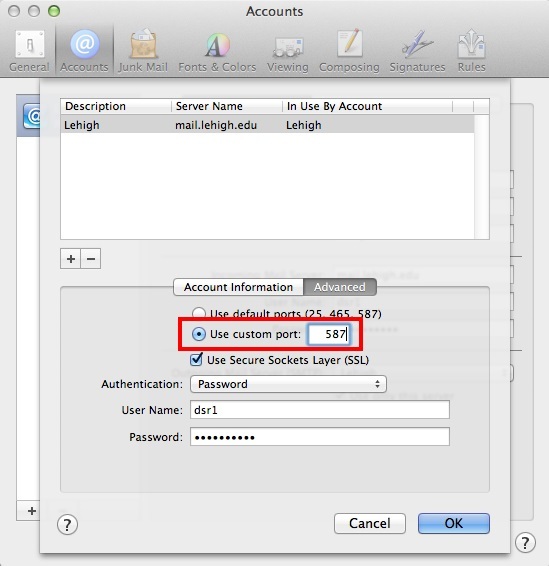 Both of these are secure (encrypted) connections and require authentication (using your Lehigh username and password). 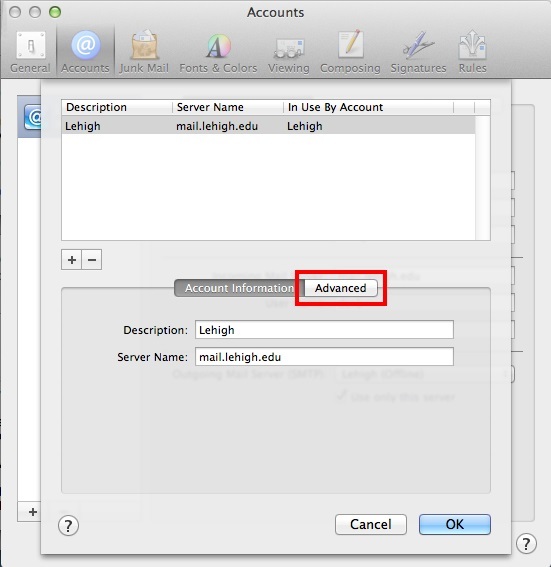 On the old legacy Lehigh mail server, there were other port numbers that were also supported (and which the MacOS automatic configuration utility for mail might have found), but these are being discontinued. For the migration to the new mail server, you must use the correct port numbers. If the port number settings are incorrect, you will see no mail folders and your Inbox will be empty (for incoming mail); and sending mail will fail. 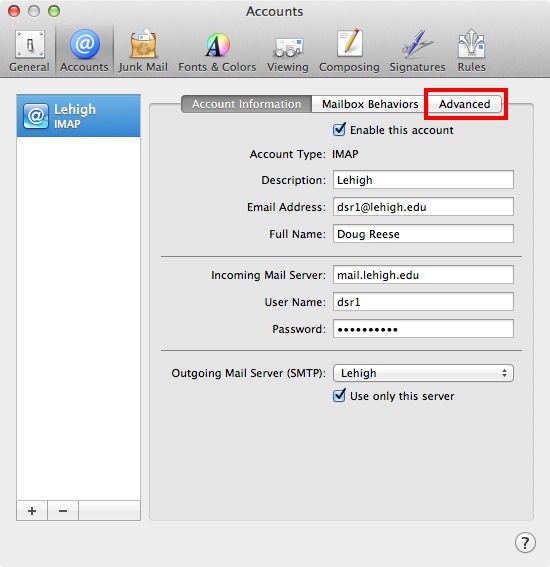 Note: This procedure only applies to users of legacy Lehigh email. It does not apply to Lehigh Gmail, and is not relevant for students or anyone else who is already using Lehigh Gmail. 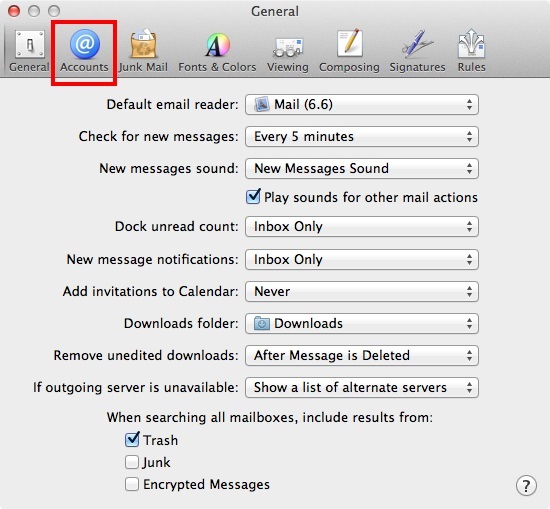 It is specific to the Mac Mail email client. Other email client programs (such as Microsoft Outlook or Thunderbird) will have a similar setting, but the exact name and location of the option controlling this setting will be slightly different. Launch the Mail application. From the Mail menu, select Preferences. 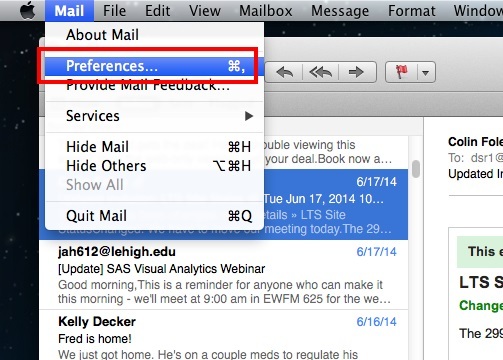 In the Mail Preferences Dialog, switch to the Accounts pane by clicking on the tab at the top of the dialog. In the Accounts pane, first make sure that the Account Type is IMAP (Note: if it isn't, you will need to delete and re-create this account). Then switch to the Advanced tab by clicking on the tab along the top of the pane. On the Advanced tab, make sure the port number for the incoming server is 993 AND make sure the IMAP path Prefix is blank (remove any text in that box). Return to the Account Information tab by clicking on the tab along the top of the pane. 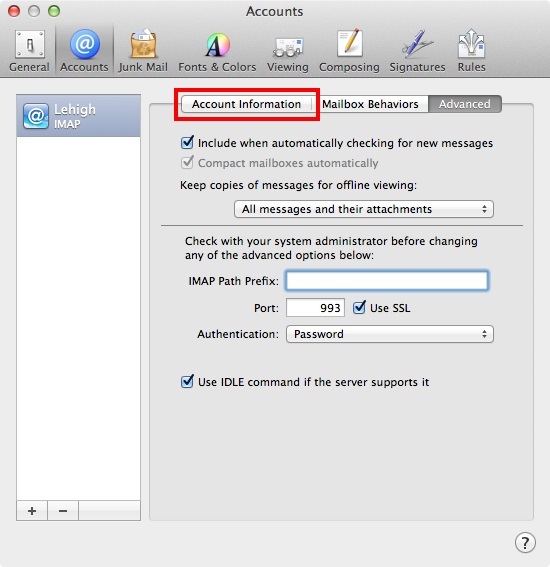 In the Account Information pane, from the pop-up menu for Outgoing Mail Server (SMTP), select Edit SMTP Server List. 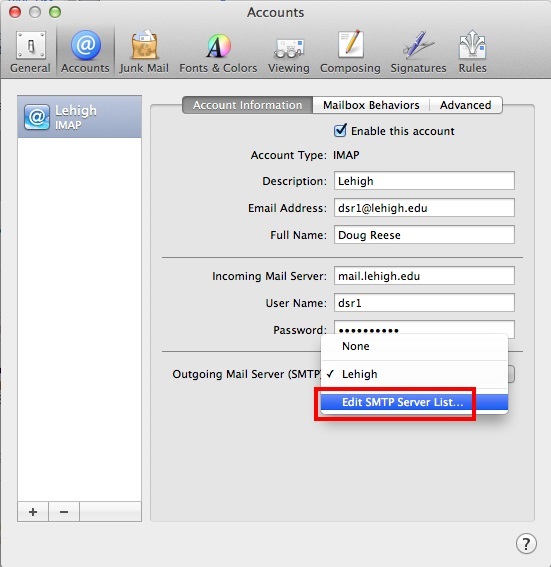 With the Lehigh mail server (mail.lehigh.edu) selected in the SMTP Server List panel, switch to the Advanced tab. In the Advanced tab of the SMTP Server List panel, select Use custom port and make sure the port number is 587. Click OK to close the SMTP Server List panel, and then close the Mail Preferences dialog window. Quit the Mail application and restart it. Be patient, as your folders may need to be re-indexed and this may take some time.